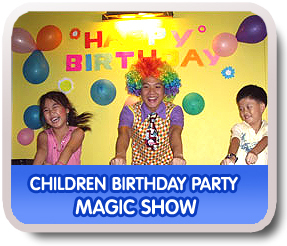 Magic show for children birthday party, QuinnMagic presents Singapore magician: magic show. Our magician will conjure up a highly interactive magic show for his audience, bringing them into a world of mysteries and funny gags which the children will enjoy. The magician will wave his magical spell on one of the world's toughest audience - children. He will keep them all engaged, amazed, laughing and thoroughly entertained. We put our guarantee on our magic show as our slogan where our competitors dare only to brag about. This is the only magic show in Singapore to have a guarantee like ours - "If the kids don't laugh, we'll tear the cheque." As the children's magic show commences, our witty and wacky magician engages our young spectators with his magical showmanship and watch how he picks and plays with his volunteers from the crowd. The children magic show encourages young minds to express their creativity and develop social confidence while interacting with one another. Of course how can we forget to give our lovely volunteers a pleasant surprise gift as a reward for helping out our magician. Together they make our children magic party a huge success as their laugher and giggles fill the room. Hear the outburst of giggles as our young volunteer helps our magician turn shredded paper into a hat, superman's brief or a funny boxer. Now how about vanishing a bottle into thin air right under the noses of our young spectators. Have you seen our thirsty newspaper "Times" who drinks up every drop of water our magician feeds him without getting wet and colorful confetti from the sky. Ain't that cool! Hmm, now that's funny, what's a diaper doing in our show? There's lots of fun and amazing acts in our children magic party show. The magic show will end with our birthday boy/girl helping the magician to perform a finale with all kids singing the birthday song. Your kid will be thrilled to be a magician for a day. "Your Children Magic show and balloon sculpturing was a delight! Days after Agnes's birthday, the kids in school were still talking about it. Thank you. Agnes insisted on having it next year. So see you around." "Great entertainment! We'll recommend you to my friends. That's the best way to thank you for doing such a splendid show for our son." "The children enjoyed the magic show and activities very much. Thank you."